Finding a glove that combines comfort, grip and chemical resistance into one isn't an easy task. One strength usually takes precedence and the other elements are lost out on, especially when it comes to comfort. But with the Polyco Grip It Gauntlet, you can have all three elements. The chemical resistance gloves are made of dual layers of nitrile which helps the gloves maintain a sturdy grip even in an oily environment. This same construction also allows the gloves to have a freedom of movement despite the chemical resistant properties, allowing you to have all three properties without any compromise. The product code for these gloves is GIOG1. 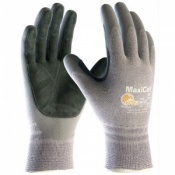 The gauntlets are a dual coated chemical resistant pair of gloves. 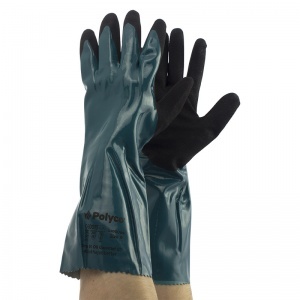 Made up from two layers of nitrile, the gloves maintain an excellent grip even in an oily environment. The first layer of nitrile rests on a seamless knitted liner. The highly resilient nature of this liner and nitrile is why the gloves are so flexible; the properties allow for high dexterity. The second layer is focused around the palm, infused with microfoam bubbles. This not only helps to strengthen the grip, but also helps to make the gloves resistant to oils and liquids. The gloves deliver good abrasion protection and have excellent durability, meaning the gloves have a long life expectancy even used in rough conditions. The gloves are chemical resistant. They have been tried and tested with the following chemicals. Before and throughout use, the gloves should be tested with the different chemical combinations being used to ensure safety. 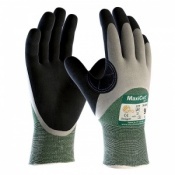 These gloves are available in five different standardised sizes, from Size 7 to Size 11. To find which size is right for you, please use the table below. For a chemical resistance guide for these gloves, please click the PDF link below.